Some know Wisconsin Sea Grant Fisheries Specialist Titus Seilheimer by his active Twitter presence as “Dr. Fish” (at the handle @DrFishSG). Soon, Titus will take on yet another identity in Manitowoc on Dec. 8. It’s one well suited to the season: Santa Claus! 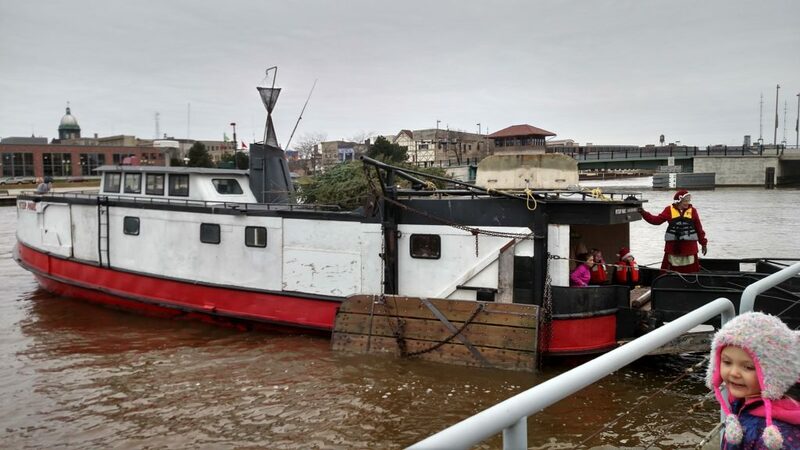 As part of the Wisconsin Maritime Museum’s annual Christmas Tree Ship Celebration and Community Day, Titus will play Santa on a fishing trawler that will arrive at the museum from Two Rivers, bearing a load of Christmas trees. The event connects to the tale of the Rouse Simmons, an ill-fated schooner that sank in Lake Michigan on Nov. 22, 1912. Captained by Herman Schuenemann, the ship sank while transporting Christmas trees ultimately bound for the Chicago market. Of course, the Dec. 8 event won’t have a sad end. On the contrary, Santa’s appearance will delight children, and it is part of free community day at the museum, filled with a range of fun activities. Tamara Thomsen, a maritime archaeologist with the Wisconsin Historical Society who has frequently worked with Sea Grant, will also be there to give a presentation on the history of the Rouse Simmons – a wreck not discovered until 1971. Titus is based in Manitowoc and has frequently partnered with the Wisconsin Maritime Museum on behalf of Sea Grant. He was asked to don the red suit by museum educator Abbie Diaz. “I’m happy to help with this. But I think my only qualification for being Santa is that I have a beard!” he said. As a researcher, Titus feels a connection with the Rouse Simmons story, since the site of its wreck is a place he has to avoid while out on the water. It is now a marked hazard area. So, although it perished more than a century ago, it is not forgotten. Find out more about the history of the “Christmas tree ship” on our Wisconsin Shipwrecks website. And get all the details about the Wisconsin Maritime Museum’s community day, which runs 9 a.m. to 4 p.m. on Saturday, Dec. 8, on the museum’s website. Admission to the museum will be free all day. This entry was tagged Christmas tree ship, Manitowoc, Rouse Simmons, Tamara Thomsen, Titus Seilheimer, Wisconsin Maritime Museum. Bookmark the permalink.